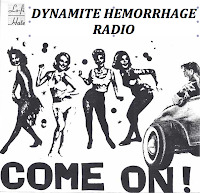 It's all about the young musicmakers of today this time on DYNAMITE HEMORRHAGE RADIO - this 65-minute podcast features a bunch of 'em, including brand new stuff from Household, Neonates, Wildhoney, The Ar-Kaics, Toxie, Terry Malts, Ruby Pins and even the swan song from Sic Alps. Holy mackerel. I also took a page directly from the book of New Zealand's (and The Dead C's) Bruce Russell, and played a set of kiwi postpunk, punk and noise from the early 1980s on "small labels", just as Mr. Russell did on this excellent podcast. I was taking notes, as you'll see. The show is rounded out by other sub-underground sound from Jackknife, Blast Off Country Style, The Spits, Dara Puspita, Bona Dish, Flesh Eaters and more. LIFE IN THE FRIDGE EXISTS - Have You Checked The Children?